Rosa María Payá asked the question back on September 30, 2014 and the news is grim 28 bodies have been found in unmarked graves but have not been identified and Amnesty International has an urgent action underway for 43 missing students. On the opening night in Miami of the iconic Mexican rock band Cafe Tacvba tour celebrating 25 years since its founding the audience displayed a banner throughout the concert that ended up on stage that read "We are all Ayotzinapa - 43 WITH LIFE - Florida is with you AYOTZINAPA." Below is the latest Urgent Action from Amnesty that outlines what has happened and calls people of good will to action. The students have been missing since September 26, 2014. The 43 disappeared students are still missing after being fired at by police and later attacked by unknown individuals in Iguala, Guerrero state. Twenty-eight bodies have been found in unmarked mass graves near Iguala, but their identities remain unclear and the search for those abducted continues. The 43 students remain disappeared since 26 September in the city of Iguala, Guerrero state, southern Mexico. Around 25 of them had been arrested by municipal police, while those remaining were abducted by unidentified armed men operating with the acquiescence of local authorities, a few hours later. All missing students are victims of enforced disappearances. On 5 October Guerrero state officials found six unmarked mass graves near Iguala, apparently as a result of information provided by some of the 22 municipal police presently under arrest. At least 28 bodies have been exhumed, but forensic tests will have to be carried out in order to identify the remains. It is not yet clear if the bodies are those of the abducted students. On the basis of a petition from representatives of relatives of victims, independent international forensic experts are assisting with the identification process. The Federal Attorney General’s Office (Procuraduría General de la República, PGR) has taken up the investigation into the unmarked graves and the identification of the dead bodies. However, the investigation into the enforced disappearances and murder of six others on 26 September, including establishing the whereabouts of the 43 students, remains with the Guerrero state Attorney General’s Office despite allegations of possible links with criminal groups and its repeated failure to carry out effective investigations into grave human rights violations. The seriousness of these enforced disappearances and killings couple with the involvement of organized criminal groups are grounds for the PGR to claim jurisdiction in the cases, but so far it has stopped short of doing so. Calling for a full investigation into the circumstances surrounding the attack and abduction of students on 26 September, including the repeated failure of state and federal authorities to investigate frequent reports of collusion between local public officials and criminal gangs. Some 500 students attend the Raúl Isidro Burgos Rural Teacher Training College (Escuela Normal Rural Raúl Isidro Burgos) in the town of Ayotzinapa, Guerrero state, some 300km south of Mexico City. They receive training to become primary school teachers in rural communities. Some of the local inhabitants are of Indigenous origin. In general, these communities – and the students themselves – are poor and suffer from high levels of discrimination, marginalization and lack of access to basic services. The students at the rural training college are also politically active and they have staged many demonstrations in relation to rural teachers, education policy and other political issues. Acts of violence have been reported in some of these demonstrations, and public authorities have frequently blamed the student teachers. The training colleges have frequently been starved of resources in recent years as rural education has not been a priority. In December 2011 Ayotzinapa students who were protesting on the main highway outside Chilpancingo, the state capital, were attacked by state and federal police resulting in three deaths, two of them students. At least 24 people suffered torture and other ill-treatment. Those police and superiors responsible for the abuses against students have never been held to account, encouraging a climate of impunity. Amnesty International has highlighted this case many times, most recently in its report Out of control: Torture and other ill-treatment in Mexico (http://www.amnesty.org/en/library/info/AMR41/020/2014/en). Arbitrary detention, torture and other forms of ill-treatment are widespread and persistent across Mexico. Most cases take place in the context of criminal investigations in which those arrested are tortured in order to extract “confessions” or “information”. Those implicated in torture, including police, army and navy, are very rarely brought to justice, with just seven convictions recorded to date at the federal level. Torture victims frequently face insurmountable challenges to prove their cases, including official forensic examinations which are rarely applied in time and in line with international human rights standards. Abduction and disappearances remain routine in Mexico with public officials often acting in collusion with criminal gangs. 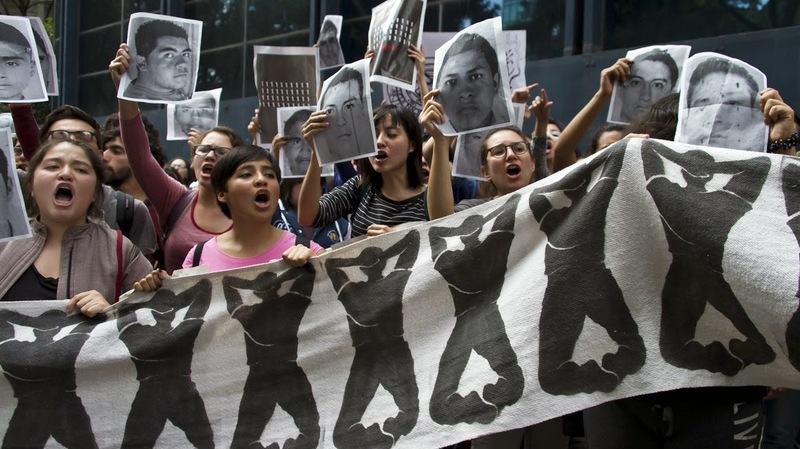 The 43 students who have been forcibly disappeared since 26 September are part of the more than 22,000 cases of people who are missing or disappeared in Mexico and whose whereabouts remain unknown, according to government figures released in August 2014. The government has repeatedly failed to explain how they have calculated this figure, as well as any further information about those cases. It is unknown how many of those people have been victims of enforced disappearances in which public officials are directly or indirectly involved. In 2013 the Federal Attorney General’s Office set up a specialized unit to investigate cases of abductions and disappearances and establish the whereabouts of victims. To date, they have not released any detailed information regarding its effectiveness. For further information see Confronting a nightmare: Disappearances in Mexico (http://www.amnesty.org/en/library/info/AMR41/025/2013/en).